At a time of prophecy and faith, the Father of Creation has stepped away from his post. Left behind to see to the welfare of humanity are the Archangels, those among His angels chosen to stand against the Fallen. If the Fallen were the only threat to the world, and if they were to stand united against those threats, the Archangels would stand a chance. 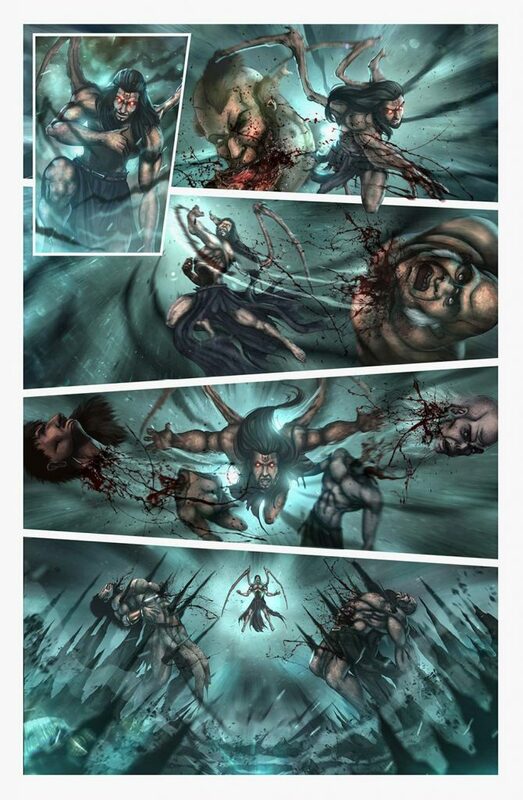 But Uriel has been beaten down and captured by the giants, descendants of the infamous Goliath. Michael has no memory of who he was or the station he held as the Sword of God. The only ones who stand together, ready to rally what forces remain against Azrael and her Fallen, are the mortal members of the House of David. 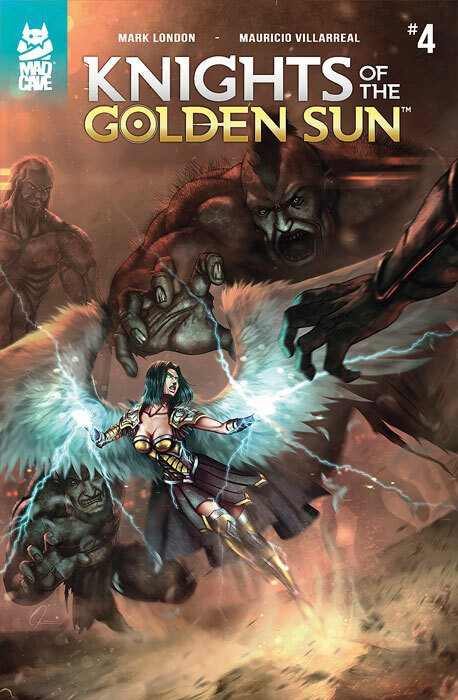 When I read and reviewed the first issue of Knights of the Golden Sun for its first release in 2017 (it was re-launched in November of last year), Mad Cave Studios was still in the middle of their initial push into the world of independent comics. 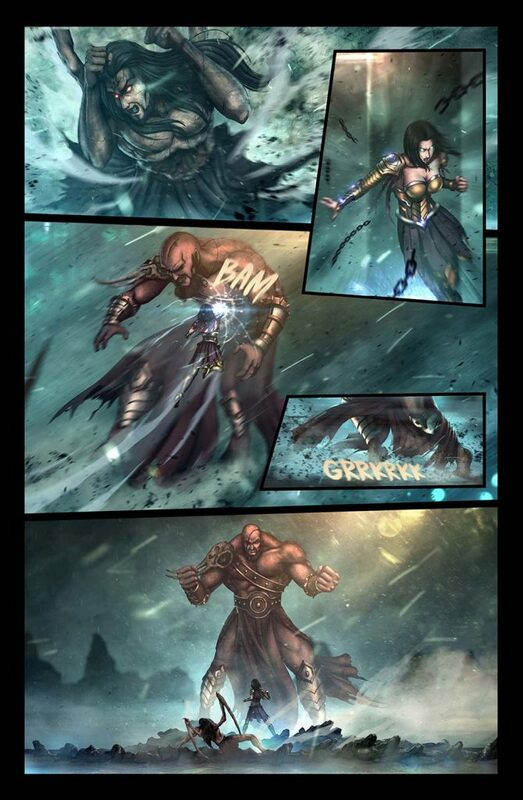 Coming out alongside flagship titles Battlecats and Midnight Task Force, Knights was a step beyond what the Cave was producing in terms of the scope of their story. An “adventure of Biblical proportions” isn’t a metaphor… Mark London crafted a story that fills in the gap between Old and New Testaments. Ambitious? Sure, a bit… but it’s the kind of gamble that an independent publisher looking to set themselves apart should be looking for in its body of work. And for anyone who hasn’t taken a look at the books coming from the Mad Cave, this is the perfect time to do so because you’d be coming aboard when creator/writer Mark London is catching his stride. As with all new writers, there’s going to be a learning curve, and it’s been great to watch as London starts to really dig into his craft. In Knights of the Golden Sun, he’s really started to find his “voice”. One thing I thought was kinda nice was that this voice didn’t include much in the way of King James’s English… no “thee’s”, “thou’s”, or even a “verily” to be found in London’s dialogue, but he still manages to catch a bit of the distance between these angelic beings and the lowly humans. 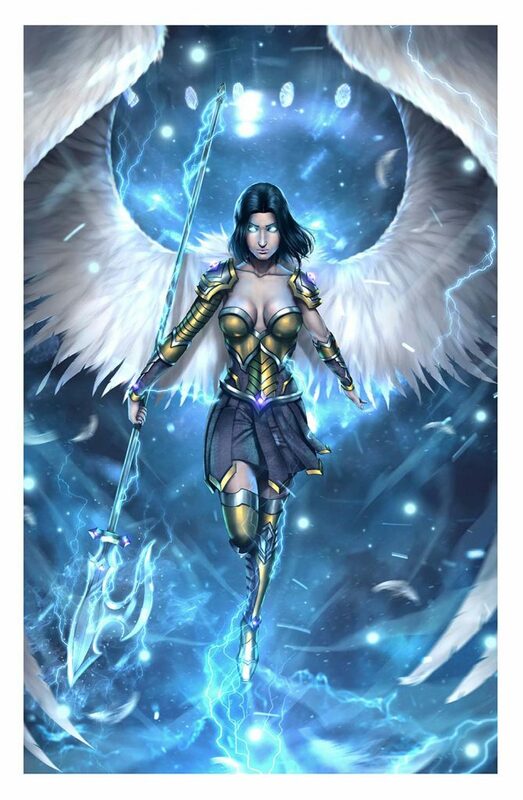 Even among the title’s Knights, there’s an unavoidable gap between someone like Uriel and the humans she’s determined to protect, and that shows through in the Archangel’s well-meaning yet somewhat superior interactions with her fellow prisoners among the giants, the people of Pella. The artwork of Mauricio Villarreal continues to uphold the “look” of the books coming from Mad Cave, a signature flair for dynamic colors that sets it apart from the herd. Better yet, Villarreal’s work doesn’t suffer from stiffness in his figures that seems to come with some digital art. Far from it, his action sequences are dynamic and there’s a real sense of the power being generated as these Biblical superheroes collide with their opposing villains. 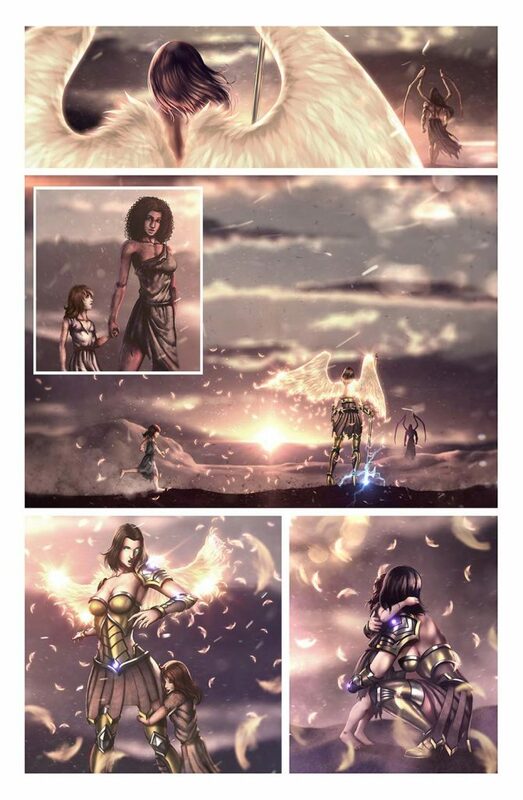 It’s in the combination of the layouts and the colors, where lightning can strike in a burst of Archangelic fury as Uriel finds her faith again, and in the rage of Lucifer as he realizes that he’s been played as a stooge. One of the titles coming out after Mad Cave’s initial launch, Knights of the Golden Sun has the benefit of its creators’ hindsight. By his own admission (check out our interview), London’s learned from the mistakes he’s made, and the comics being put out by the still-new publisher are better for it. In this one, they’ve managed an impressive balance in storytelling, with a definite cinematic visual flair. Only four issues into the run, it’s a great time to dive in. Love all things Mad Cave, they are doing a terrific job with their titles. Great review!